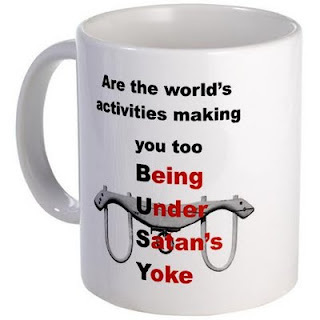 Apostolic Titbits: Don't be too B-U-S-Y! "Do not be ignorant of Satan's devices and therefore allow him to take advantage over you." (2 Cor 2:11, Abi's Paraphrased Version). 3) Make them work long hours to maintain empty lifestyles. 4) Discourage them from spending family time, for when homes disintegrate there's no refuge from work. 5) Overstimulate their minds with television and computers so that they can't hear God speaking to them. 6) Fill their coffee tables and nightstands with newspapers and magazines so they've no time for Bible reading. 7) Flood their letter boxes with sweepstakes, promotions and get-rich-quick schemes; keep them chasing material things. 8) Put glamorous models on TV and on magazine covers to keep them focused on outward appearances; that way they'll be dissatisfied with themselves and their mates. 9) Make sure couples are too exhausted for physical intimacy; that way they'll be tempted to look elsewhere. 10) Emphasize Santa and the Easter Bunny; that way you'll divert them from the real meaning of the holidays. 11) Involve them in 'good' causes so they won't have any time for 'eternal' ones. 12) Make them self-sufficient. Keep them so busy working in their own strength that they'll never know the joy of God's power working through them. Do these twelve things faithfully. I promise-it'll work!" Have you figured out the difference between being busy and being successful in what God's called you to do? Sometimes being B-U-S-Y just means Being Under Satan's Yoke! Keep praying as Ephesians 6:17-20 says, " 17 And take the helmet of salvation, and the sword of the Spirit, which is the word of God; 18 praying always with all prayer and supplication in the Spirit, being watchful to this end with all perseverance and supplication for all the saints— 19 and for me, that utterance may be given to me, that I may open my mouth boldly to make known the mystery of the gospel, 20 for which I am an ambassador in chains; that in it I may speak boldly, as I ought to speak." READ THE WORD OF GOD DAILY and MEDITATE on it, BROWSE through it again and again, SPEAK and MUTTER it over and over again and finally LIVE THE WORD. PRAY daily for YOURSELF, for YOUR FAMILY, for YOUR CITY, for ALL SAINTS and for ALL THE PREACHERS AND TEACHERS OF THE WORD OF GOD to be effective in extending the kingdom of God! When you do these things all other things will fall inline with the will of God and you will make sure that your guard against Satan's devices of deception are always up and active to keep it always defeated. Best Wishes!